I finally managed to score a set of cladding with all of the brackets for the single cab, unfortunately the seller had already sold the bumper. I am looking for a rear bumper in good shape with the brackets to mount it. Let me know what you have, thanks! I have a regular cab short bed 04 Silverado, I’m looking to clone my truck. New on here. If anyone is selling a full kit with brackets or knows how I can get my hands on one or some parts please let me know. Thanks! Anybody have a front bumper laying around? Preferably oem, my streetscene one always bothered me. Reason I ask is a horse trailer in my town ripped into mine yesterday and drove off, I am devastated . I know it will need brackets as well but I will take what I can get. Let me know! Thanks. - Edit - Last week somebody backed into my front bumper, AGAIN . I talked to the body shop who will be doing the work and they printed off an estimate but told me it would be cheaper for me to find a complete one rather than them buy one from the dealership, so I'd appreciate it if anyone could get to me with a front bumper cover, any of the brackets, ducts, silver grills, etc. Thank you so much! Have their insurance cash in hand ready to buy if I can get a good deal, if not I suppose I will be buying a new one.. Lol. Anybody have a spare baffle? Which brake setup is best? Anybody here rebuild and repair instrument clusters? I got my SS and it was flawless except for the oil pressure gauge doesn't work, the RPM one goes way up to 6,000, and the speedometer does as well, so who rebuilds them for a good price? Don't know if these need to be programmed again or not..
Hey everybody, from up here in Canada. Just bought a 2003 SS and it's my 1st truck. I get it on Halloween. Any ideas on what to do 1st with my new truck? Anyone know how much SS Silverado seats in good condition are worth (no tears, rips, etc)? Found a set that look like roughly 50k miles on them and am considering buying for the single cab but do not know what to offer the guy. Thanks! Wats up guys? I was posting because I wanted some feedback on what is the best exhaust system setup just to gather opinions.. I do live in California, so the control of emissions is the worst out here , probably the strictest out of anywhere here in the states I think. To start off true dual exhaust is illegal out here and it's rare to find a guy that will do it at a shop, that plus cars out here have to get smogged every two years and it will not pass with true dual. The setup that I have right now on my truck is dual with a flowmaster 40 series muffler, I think that's the 2nd loudest muffler they carry, the loudest would be the super 10, I don't exactly want to be that obnoxious ****with the extremely loud truck driving down the street, I just want to change the sound a bit on what I currently have, any thoughts? 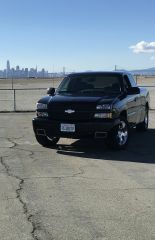 Okay, so I have been doing a LOT of reading on this site and others in regard to engine performance, upgrades, power and drive-ability for my Silverado SS. Quite frankly there is SO much information it can be quite daunting and confusing for someone such as myself; as I am a do-it-yourselfer with little knowledge in what I am looking to do. So please bear with me. My truck is a 2003 Silverado SS with 62,000 miles. It is in near perfect condition, always well maintained and has been stored in a climate controlled garage for the last 5 years or so. I do NOT drive it everyday. The only current modifications are: Long tube headers Custom 2 1/2 Borla Dual Exhaust (with X-pipe) Cold Air Intake. To make a long story short, I want more horsepower and Torque. I would love to have somewhere between 550-600hp at the crank with respectable torque numbers. I am considering the following: 421CI 4.03 pistons -11cc Dish 6.125 Crank 247cc,68cc heads cam choices are as follows: Intake Duration 212 224 216 Exhaust Duration 218 230 220 Intake Lift .558 .581 .56 Exhaust Lift .563 .591 .56 LSA 115 114 114 2800 Stall (?) What do you all think? Is 550-600 hp achievable on this setup naturally aspirated and yet still be able to put on a supercharger at some point in the next few years without going back in to the engine? Please keep in mind that even though this is NOT a daily driver, it still needs to be considered a daily driver. I don't want some crazy lopey engine. I need to be able to jump in it and drive it across the country, or pull a small trailer (6 1/2 ' by 12 ' single 3500lb axle) or my wife needs to be able to jump in and drive it to work, etc. It will likely never see a race or drag strip. I have considered putting on a Radix or Whipple on the stock 6.0 instead of building an engine. However, I just don't believe I will be satisfied with the outcome. Your guidance is really appreciated. As Title States, Looking for a complete front diff assembly with 4:10 gears. Grenaded the current one. Let me know what you have and we can work out a deal. Will need to be shipped as im up in Canada. Thanks in advance. Looking to buy 2006 SS Intimidator,Anybody have one for Sale?